The MTA has a lot of federal money on hand to build up its — and the region’s — resiliency in the post-Sandy world. Expanding transit access and reducing auto dependency is a major part of that resiliency as it better equips the city to deal with both the aftermath of storms and the build-up to them. But some of that spending is coming under fire in a rather nuanced way. 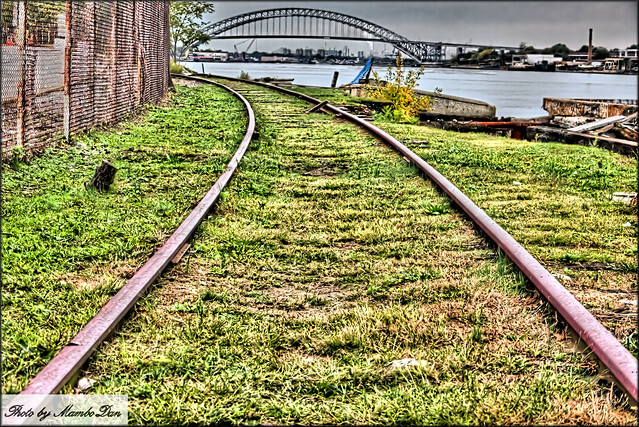 The project at issue concerns Staten Island’s defunct North Shore Rail Line. The MTA has proposed turning it into a busway and ruled out light or heavy rail due to costs. Staten Island politicians and transit advocates are not keen to pave over a rail right-of-way for a bunch of buses, and as the MTA looks to move forward with the busway thanks to an infusion of Sandy recovery dollars, these Staten Islanders are crying foul. The MTA has approved a plan to construct a North Shore bus rapid transit (BRT) system and pay for it with Superstorm Sandy Recovery Funds, according to an agency capital program report obtained by the Advance. While Assemblyman Joe Borelli said the agency’s board-approved project is important for the North Shore, he believes the money isn’t being properly spent, especially since the area where the BRT system will go wasn’t affected by the storm the way the South and East shores were. “If you’re going to include Sandy money, at least include us folks down here,” said Borelli, adding that while the project is necessary for the North Shore, the money being spent should go to resiliency projects that cover the geographic area that suffered transit losses during the storm. The bus path that runs parallel to the Kill van Kull would also be available for emergency vehicles to use at all times, said Ortiz. It’s easy to see how this project can benefit everyone and be a part of resiliency planning. It is, in fact, the point of resiliency money. But while these objections are easy to dismiss, Borelli raises another point: Moving forward with the North Shore busway could put an end to discussions concerning a light rail network for Staten Island that connects over the Bayonne Bridge with the Hudson Bergen Light Rail system. I understand why DOT and the MTA have engaged in a love affair with buses of late. It’s far cheaper, quicker and easier to implement than it is to build a subway line or install a light rail system with the necessary infrastructure. It’s a change that, despite the horrendously slow rollout in Brooklyn, could happen in the span of a few months. Yet, it’s a poor substitute for something with higher capacity, more frequent service and the potential for connections to another service. New York has resisted the allure of light rail as cities as transit-starved as Phoenix and Houston have turned to it as a potential solution to congestion. Staten Island deserves the same before the MTA paves over a rail right of way for a bunch of buses. Some Staten Island Ferry boats will soon run every 30 minutes throughout the day. 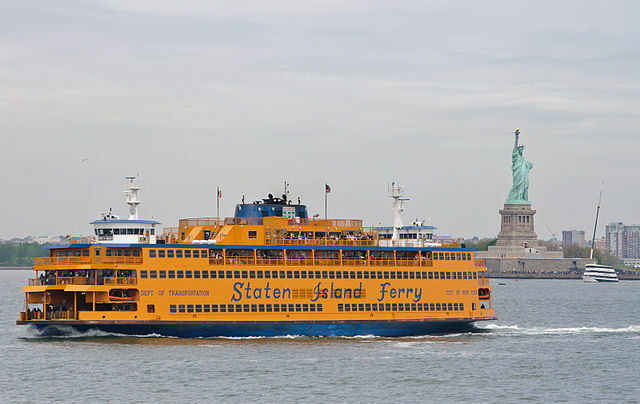 After reading coverage of Wednesday’s City Council vote to increase overnight Staten Island ferry service, I’m beginning to believe that mentioning the potential 59-minute wait for a boat as a Staten Island rite of passage is required by law. So here you go: It is a rite of passage for Staten Islanders to mistime their arrival at Whitehall St., miss a boat and be stuck waiting around for an hour in a rather drab ferry terminal as 1 a.m. slowly turns into 2 a.m. Not any longer. In what I believe was a unanimous vote, the City Council approved a measure to increase ferry service such that boats will leave no less frequently than every 30 minutes throughout the day. The new law contains phased implementation. Until May 1, 2015, ferries must run at least every 30 minutes until 2 a.m., and after May 1, 2015, service throughout the night must be on half-hour intervals. The law is set to take effect immediately, but the Mayor may not sign it immediately. Though the bill has enough votes to override a Bloomberg veto, it will likely be up to his success to implement — and pay for — the new service. There is an out as well though in that if DOT and the mayor determine that “it is not economically feasible to fully expand service,” the city can issue a report explaining why they aren’t expanding all service and must reassess the decision every two years. Such a review will have to include ridership figures, economic development and population changes, and plans for future expansion of ferry service. It’s an intriguing loophole that relies on an interpretation of “feasible” that remains hazy. Considering the ferries are subsidized entirely by the city, what does “economically feasible” even mean in this situation? SI politicians began to praise the move a few days ago when it became clear the measure would pass. “I think it is a very powerful message to send to the residents, the commuters and the potential investors in the North Shore — that it’s open for business and that there is a consistent means of transportation,” Council member James Oddo said. Debi Rose compared the situation to waiting for a subway. “I am so excited that this long-awaited legislation is moving forward. This bill is about basic fairness — waiting an hour or more for the ferry at night and on weekends is an unacceptable situation which is not tolerated in any other borough,” the North Shore representative said. Now, it’s all well and good to expand ferry service, and it’s a noble gesture. Does it make sense? City officials estimated that the full overnight service could cost $15 million per year more, bringing the total cost to run the ferry to $115 million. Meanwhile, an Independent Budget Office analysis earlier this year called for an end to overnight ferry service entirely. On a typical weekday, just 2-3 percent of the daily 61,000 riders use the ferry between the hours of midnight and 5 a.m., and the smallest boats fit over 1100 people with nine crew members. Replacing these ferries with express buses would save the city around $4 million. Economically feasible indeed. Meanwhile, I still wonder about the wisdom of a free ferry ride. It’s possible to get from a home near St. George to a job on Wall St. without paying a dime whereas anyone traveling via subway between boroughs has to pay a fare. Is there a way to capture some fare revenue on the Staten Island ferry while ensuring that daily commuters don’t suffer through a two-fare trip? It’s an operational challenge that isn’t impossible to overcome, and the revenue from, say, tourists or other non-regular riders could offset the costs of an increasingly expensive service. It’s also a political non-starter amongst a particularly prickly group of politicians. Good things come to those who … complain? The inherent contradictions in New York City’s approach to and embrace of transit are at their peak on Staten Island. The borough’s residents and politicians clamor for better transit. They want subways to span the harbor or the narrows; they want easier access and more reliable service. What they don’t want though apparently are incremental and easy-to-implement changes to the bus network that prioritizes road space at the expense of drivers. Anything but that. The trouble, as we well know, started with Select Bus Service. The MTA and DOT worked to bring their baby to Hylan Boulevard. Dedicated bus lanes and some pre-boarding payment options along with, eventually, signal prioritization have led to faster buses and satisfied customers. The system has its flaws, and it shouldn’t be confused with bus rapid transit. But it’s working. The city’s notoriously slow and unreliable buses are getting faster. Certain elements of Staten Island though aren’t happy. With the debut of camera enforcement earlier this summer, complaints skyrocketed. Earlier, Staten Island politicians had been responsible for a successful drive to convince the MTA to turn off SBS’ hallmark blue lights, and during Tom Prendergast’s confirmation hearings, Sen. Andrew Lanza went on a six-minute rant on Select Bus Service and the lack of space for cars. A few days later, Nicole Malliotakis bashed camera enforcement as a violation of civil liberties. All of this over a bus lane that’s designed to speed up travel for the masses. In response to claims people have been unfairly ticketed by some Select Bus Service lane cameras on Staten Island, the city Department of Transportation is considering changing the rule slightly to better reflect reality. Instead of making the next immediate right-hand turn after entering the dreaded red bus lane — the current rule — motorists may be allowed to make a right-hand turn within 200 feet of entering the bus lane. “A vehicle may not be operated in the bus lane during restricted hours for more than one block or two hundred feet, whichever is less,” is the proposed amendment that the DOT discussed at a 10 a.m. meeting Wednesday. The DOT confirmed that they took public comments Wednesday morning and have received written comments and will consider both as it “proceeds with the proposed rule amendments,” a spokesman said. The possible change of heart came after local officials cited a Signature Bank in Grant City, just past Hunter Avenue on Hylan Boulevard, where bank customers were receiving tickets for turning into the bank’s parking lot, and on Richmond Avenue in New Springville, where motorists were being ticketed for not turning into a private parking lot near the next available intersection, which doesn’t occur until Platinum Avenue. The bank’s parking lot has been a flash point in the debate over the bus lane. Politicians claim there isn’t enough space in between the turn for the bank and the turn for the private lot, and a few people who have gotten tickets have raised a ruckus. If it’s a safety issue unique to this intersection, I’m not going to argue against a change, but I can’t help but think that the NIMBYs are at it again. Time and time again, we see transit improvements rolled back because a loud minority makes a stand. Along 34th St., there is no transitway because a handful of people were concerned about door-to-door access to their apartment buildings. On 125th St., buses are backed up from river to river because a few parking spots would have been taken away. It’s noble that DOT and the MTA involve the community and seek guidance and support from Community Boards, homes to some of the city’s most crotchety and progress-shy people, but at a certain point, the experts should be allowed to do their jobs. Progress is slow, and progress can be painful. It involves recognizes priorities and learning that the thing you want isn’t the thing that’s best for everyone else who lives around you. When it comes to transit planning, New York City has a long way to go even though the city was built with a transit backbone that in no small way powers the entire city. This Ferris wheel sure will look great surrounded by a mall, hotel and acres of parking lots. What do you do with Staten Island? What is its role in the future of New York City? How does the city develop accessible areas while opening up other parts of the island? And should these other parts even be opened? These are the perennial questions facing the city’s isolated borough, and with development plans on tap and a mayoral election in full swing, Staten Island is inching, perhaps reluctantly, into the spotlight. Over the next few years, for some reason or another, the St. George area in Staten Island may become a destination. Near the ferry terminal is a quaint minor league ballpark where some of the greenest prospects play, and in a few years, a 350,000 square foot outlet mall, a 200-room hotel and a 625-foot tall Ferris wheel are set to debut. These aren’t attractions for the natives; they are very much designed to attract tourist dollars to the area. The city is actually being blatant in their attempts at drawing people to Staten Island. NYC & Co. recently unveiled a new initiative promoting day trips to Staten Island. The campaign encourages visitors to check out the North Shore, and The Wall Street Journal recently urged its readers to look even further than that. Anne Kadet urged her readers to dig deeper, and Staten Island’s politicians hopped aboard the effort. So that’s all well and good, but what about Staten Island’s problems? We can send a bunch of tourists to Staten Island on the ferry, but then they will find themselves stranded at the norther end of the borough trying to decipher a convoluted bus map or relying on expensive cabs to get anywhere else. Tourists, by and large, don’t rent cars when traveling through New York, and the car ride to Staten Island — via congested roads in Brooklyn — is hardly an easy or convenient trip. The Staten Island Rail Road serves some of the island, but large areas are without easy transit access. What can the city do? The easy solution is a North Shore rail line reactivation. Despite the glaringly obvious need, the MTA over a year ago issued a feasibility study promoting bus rapid transit instead. A subway connection, via the Narrows to Brooklyn or the harbor to Manhattan, is discussed only on message boards devoted to our transit dreams. Meanwhile, the plans for these St. George attractions call for a considerable amount of parking. Shocking, I know. There’s no easy solution to this problem, and many Staten Islanders are OK with that. They don’t necessarily want the density that comes with transit or the crowds that come with tourist attractions. The city though is intent on turning at least a part of Staten Island into a destination for better or worse, but they’re doing it without addressing fundamental problems of access and accessibility. We may not want a giant Ferris wheel sitting in the harbor, vulnerable to whatever weather may come its way, and we certainly don’t want a Ferris wheel, mall and hotel without a way to get there that doesn’t involve more cars on the road. But that’s what we’re on the verge of getting. For the past few weeks, I’ve spent some time examining the contradictions of Staten Island and the borough’s tenuous relationship with transit. Its residents want better options, but they panic once they realize adding something such as Select Bus Service may mean fewer lanes for cars. They ask for subway connections to the rest of the city but are worried it could disrupt their quasi-suburban lifestyle. What Staten Islanders want in principle isn’t always what they want in practice. Now, it’s the Staten Island Railway’s turn to come under the microscope, and State Senator Diane Savino has supplied us with the perfect opportunity to assess the MTA’s southern-most subway. Savino, an on-again/off-again champion for transit who has thrown a fit over plans to send the subway to New Jersey but not Staten Island yet voted to steal money from the MTA without bothering to read the bill, has commissioned a report on the Staten Island Railway. Hardly scientific, it relies on anecdotes and assessments from the line’s riders, but it doesn’t paint a positive picture. Staten Island Railway riders want better service. Period. They want better security, better lighting, better ferry connections, better station environments. They want rail — and not a bus lane — on the old North Shore right of way, and they seem to want a connection to the Hudson Bergen Light Rail in New Jersey as well. As I read the report, though, I kept wondering if they were all willing to pay for it. The Staten Island Railway is a curiosity in New York City. It provides 4.4 million paid rides annually, but fares are collected upon entry or exit only at the two most northern stations. Not many do, but Staten Islanders are free to ride from Stapleton to Tottenville without paying as often as they’d like. To improve the Staten Island Railway — to eliminate odors many find pervasive and offensive, to improve security — would likely involve rethinking how the fare works. So onto the report. You can read the whole thing right here on Savino’s website, but I’m not sure I’d recommend it. It’s white text on a blue background, and it’s poorly written. Yet, it’s earnest. It’s fighting for better transit and features the voices of the people who actually ride the Staten Island Railway. “We need a North Shore Railroad built, not a bus lane,” said one of them. “As a Staten Island resident who does not live near/use the SIRT, I would like to see more stations and lines extending to centralized parts of Staten Island like the North Shore. This will encourage more public transportation and dispel traffic,” said another. “The trains are over 40 years old They need new cars. They also need a public address system at each station so riders can be told of delays/problems on the line,” said a third. These are real complaints for real people. These folks who ride though aren’t happy with the service. The trains are dirty, they say. They want express service from popular stations, new rolling stock, more frequent service and nicer station environments with better connections to buses and the ferries and perhaps park-and-ride options as well. The service received an F from its riders in an admittedly biased survey. Ultimately, Savino’s suggestions are practical and reasonable. She urged upzoning around train stations to spur development, a train tracking app for the SIR, weather protection and concessions at high-traffic stations, security cameras and even a new station to serve the Rosebank area (with funding from bond acts and a governor’s transit fund). These are incremental changes that could drastically improve intra-borough travel along the Staten Island Railway. But does anyone want to pay for them? A Staten Island ferry forges forward. With the chance to elect a brand new mayor for the first time in 12 years staring New Yorkers in the face, the vagaries of electoral politics with a mix of extreme weather-related concerns lead to an outsized focus on some minor issues. When it comes to transportation, we’ve seen candidates obsess about buses, and lately, ferries have garnered some headlines as well. Candidates and representatives just love to talk about ferry service. Lately, two distinct ferry routes have taken center stage. One involves a current initiative to provide ferry service from the Rockaways to the isle of Manhattan. This route sprang up after Sandy cut off the peninsula’s subway connection, but it’s hardly a new idea. Time and time again, this ferry route has failed due to high operating costs and low ridership. The current service costs just $2 and has seen ridership of around 700 a day. It will be extended through Labor Day, but the city won’t say at what cost. In the grand scheme of New York City spending, the $4 or $5 million spent on a stopgap measure designed to alleviate the stress of post-hurricane travel won’t make or break anything. It’s worrying to see the city stay mum on costs when ferry subsidies far outpace per-passenger spending on buses or subways. But if the Rockaway ferry is a short-term measure, that’s fine. Budget watchdogs and transit advocates can raise a stink if this goes on forever. That other ferry service, though, warrants more of a look. Another provision of the compromise back in 2004 was that the DOT had to conduct studies of ferry ridership and provide them to the Council. [Assistant DOT Commissioner Kate] Slevin cited low off-peak ridership at several points but couldn’t provide any data. Perhaps the fact that there are a surprisingly high number of people who take the ferry after 7 p.m. on Saturday and Sunday and even after midnight on weekdays explains the DOT’s reluctance to provide the Council with a more thorough ridership analysis. DOT doesn’t want to know how many off-peak riders there really are. But again, that’s not the point. People should not be stranded in a waiting room for an hour in the self-anointed “greatest city in the world.” All New Yorkers should be able to access adequate, reliable mass transit services from one borough to another. On Staten Island, with no subway, that’s the ferry. The 2004 compromise mentioned by the paper involved an agreement between the Mayor’s Office and the City Council to increase peak-hour and daytime service while maintaining hour-long headways at night. The City Council had asked for service every 30 minutes, but the Mayor threatening to bring a costly suit to maintain service levels at every 60 minutes. The agreement rested on ridership levels that DOT is hesitant to release. I certainly feel more frequent ferry service would behoove the city as a whole, and the mayor is pushing forward on a plan to bring a 625-foot-tall ferris wheel and giant shopping mall to within steps of the ferry terminal. Such attractions scream out for more frequent ferry service. But let’s propose something else: Why not put this effort into some serious planning for a Staten Island subway connection — and one that would obviate the need for any ferry service? As it stands today, the city invests $108 million annually into ferry service. The initial capital costs for a subway to the ferry terminal would probably run upwards of $5 billion — or 50 years of ferry subsidies — but subway service would generate revenue. Fares would be collected, and the one-seat, high-speed connection would lead to an increase in property value and tax revenue for the city too. A more rigorous study for the ridership and cost projections could boost this argument, but you see where I’m going with it. New York City has such a tenuous relationship with its waterfront due to years of development patterns that prioritized heavy industry and cars over people and job centers, but ferries still have their roles to play. It seems that Staten Island needs more frequent ferry service. With the increased attention over the next few months on what is often a forgotten borough when it comes to transportation, perhaps now the stars will align for a few more boats. Plans from 1939 show a Staten Island subway connection via a Fort Hamilton Parkway subway. The endless parade of mayoral forums various boroughs and city organizations host over the course of an election season may not bring much clarity on the differences amongst the candidates. After a while, everyone starts to sound the same, and the various discussions blend together into one giant mess of pandering city politicians. Yet, they can provide fodder for potential projects that may never have a chance to see the light of day, and last night’s on Staten Island did not disappoint. Last night, in between candidates decrying state control of the MTA and the need to improve ferry service, former MTA Chairman and GOP mayoral hopeful Joe Lhota spoke about the need to connect Staten Island to, well, somewhere. During the forum, Lhota discussed the need to connect the R train to Staten Island. Lhota’s plan, hardly unique in the recent history of proposals to send the subway to Staten Island, harkens back to the original 1913 BMT plans and the 1939 IND Second System proposal to dig under the Narrows via 67th St. in Brooklyn. As part of an aborted effort to realize this subway extension, workers dug out around 150 feet but gave up after a dispute with Mayor Hylan in the mid-1920s. 1912 plans connect a subway tunnel under the Narrows to the BMT’s 4th Avenue line. So does it make sense for 2013? Ignoring the idea that Staten Island is likely better served with rail on the North Shore and a connection to the Hudson Bergen Rail Light, let’s look at a potential cross-Narrows connection. First, we have the issue of cost. In 2007, Lew Fidler proposed transit and rail freight tunnels that he estimated would cost a total of $10 billion, and in 2010, Diane Savino claimed a subway connection would set back the city by $3 billion. As there are no serious recent studies on the tunnel, it’s unclear how much it would cost, but billions — with a b — is a good starting point. Next up are travel times. My kneejerk reaction to suggest that a cross-harbor tunnel with a direct connection to Lower Manhattan would be a better use of funds, but it would use up more of those funds. Furthermore, travel times to key job centers may not be worse along 4th Ave. If a Staten Island subway ran express or if riders transferred at 59th St. to an N, that segment of ride lasts about 10 mintes to the Atlantic Ave./Barclays Center stop and around 30-35 minutes to Times Square. A cross-harbor subway, spanning the 5+ miles to the 1 at South Ferry or R at Whitehall St., would likely arrive in Lower Manhattan in about 8-12 minutes but would bypass any job centers in Brooklyn completely. Meanwhile, there’s a third cost element to consider: Would either a cross-Harbor or a trans-Narrows subway allow the city to cut back or eliminate Staten Island ferry service? According to the latest figures, the subsidizes ferry trips to the tune of $108 million annually. Cutting ferry subsidies to zero would still require three decades or more to recoup costs, but fare collection could help offset the investment. That’s a dirty calculation that assumes the city could cut ferry service entirely, but it’s a factor to consider at least. For now, we’re just dreaming and thinking off the cuff. No one is yet willing to champion a subway to Staten Island, and even those politicians such as Savino who are willing to talk about it use it as a threat more than a promise. At the mayoral forum, Lhota recognized a need and a talking point that plays well to the audience, but the truth is that there are far more worthwhile subway expansion projects than this one. Staten Island will likely just have to keep on waiting. Considering Staten Island’s lukewarm embrace of Select Bus Services and the fits SI politicians threw over flashing blue lights, the news that camera enforcement is coming to SBS bus lanes should raise an eyebrow or two. As the Staten Island Advance reported yesterday, DOT crews are installing cameras along the bus lane on Hylan Boulevard and expect to activate them by month’s end. Those drivers found cruising down the SBS lanes during certain hours will receive a $115 summons in the mail. According to the Advance, drivers can make only an immediate right-hand turn or pick up and drop off passengers, but continued travel in the dedicated lane will result in a fine. Already, Staten Islanders are concerned that “drivers unfamiliar wth the area could be at a disadvantage,” but these residents recognize the benefits. “I think overall, for the intention that they are trying to do in keeping motorists out of the lanes, it will work,” Michael Reilly said to the paper. Lane enforcement is the next step in improving the bus system. Without it, SBS lanes are nothing but painted strips of asphalt, and the cameras will help clear the lanes of cars while keeping the buses moving. DOT plans to add signal prioritization to Staten Island later this year, and by then, we’ll know how accepting the prickly borough has been of camera lane enforcement efforts.